What can texture do for a food photo? 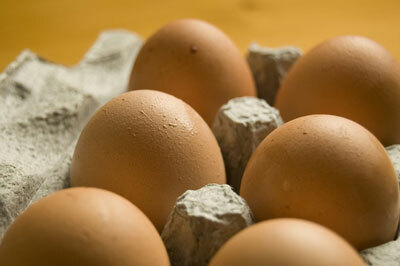 A textured background can be an important element of the overall image in food photography. Texture can enhance the quality of the image, provide it with a feeling of age, and make it interesting. When you use a textural background, you don’t necessarily see the texture at a granular level, but you do get the perception of a little something extra. Something tactile. Something deeper. Using weathered woods, nubby fabrics, or wrinkly paper provides great texture and interest to any subject. If you’re lucky (or persistent), you may be able to find some truly unique wooden cutting boards or trays at antique stores to add to your housewares library. You can then use these treasures in your food styling images to add to the feeling of quality, realism, and home. Check out the cool background under the cupcake in the following figure. The background is an old tray with different-colored milk paints on the slats. The texture of the weathered wooden tray, combined with the subject, provides a sense of old-fashioned Americana. Also, the blues in the tray really pop the blue sprinkles on the cupcake. 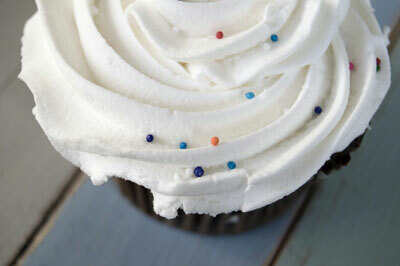 The texture of the faded colored wood tray under this cupcake adds interest. Wrinkling up a bit of white paper can add an unusual, modern look to your food images. This paper can be a great base under cookies or the like, or you can use it as just a hint in the background. When searching for an interesting environment for a shot, you may need to grab whatever’s currently at hand. For example, you can wrinkle up a brown paper bag to provide an awesome textural background for sandwiches or baked goods. It provides a just-unwrapped feel to the photos. Working with cardboard can add a lot of depth and texture to an image. Cardboard can be corrugated, pressed, bumpy, or smooth. The bumpy look, shown in the egg carton found in the following figure, makes for an image that you feel like you can reach out and touch. A cardboard carton adds texture and the colored background adds depth to this shot. The faded look of old or worn fabrics and linens has also influenced the current look of food photography today. These types of fabrics create the overall look of home, wholesomeness, Grandma, and apple pie. You can take that look one step further with the use of burlap. Using burlap as an accent in an image really provides a unique earthiness to a shot. Faded, earthy fabrics and materials are great accents for some shots, providing a wholesome look, but they’re not for elegant and upscale shots. Alternatively, there’s much to love about a refined white linen setup. When you can see the starch in the white napkins and tablecloth, it provides a pure and elegant setting for an upscale shoot.